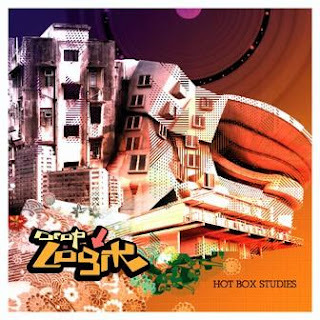 Were proud to introduce you to the debut full-length artist album from Black Bridges very own Drop Logik. Hailing from the mountains of the Southwest United Crates of America, a sound physician was born. Making drum kits out of trash cans, empty paint barrels, and whatever the hell else made noise, Chad Dixon aka Drop Logik aka Crate Diggler, began rearranging sound from an early age. Moving on to simply looping beats from dual cassette decks to buying his first sampler and drum machine and so on and so forth. Its always been an outlet of inner combustion ready to be released into your headphones. Now is the time to press play! Hot Box Studies bangs out space age mental gymnastics with crunchy samples and syncopated beats. Musical movements are cut together with turntablist acumen across a deep abyss of sound as swirly interludes play between the loftier scores. Stand out picks include the cut-em-up-flapper Hear To Wear, the sultry big beat Get!Get!, and the outer space gospel Out Of My Head. Finally,Smoke Ring Dreams brings us home and serves as your well deserved introduction to the one and only Crate Diggler.